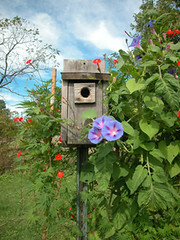 A growing number of bird lovers are not only enjoying the fun of bird watching, which is generally done from a distance, but also expanding on their hobby by designing and then building their own bird houses to draw feathered friends right into their own backyards. When you are designing your own bird house it does not have to be a very expensive process, and if you like woodworking and DIY projects then it can be a really fun activity for a free weekend or a day off – plus you can get your kids involved when it comes to decorating! There are a number of pre made kits which are perfect if you are a new bird house builder to help you get started, but if you are used to DIY projects then you can always create your own from scratch. This requires a bit of pre planning and creating a design that you can follow, then all you need to do is purchase the materials you need and put them together. Luckily most hardware stores will have everything you need, and it is a good chance to use your power tools. If you need some inspiration for your new project, there are countless websites that you can take a look at that will suggest some good ideas as well as offer tips on the design process and construction. There are also several books and magazines available on the subject, with some focussing on specific species of birds such as swallows or titmice; these often suggest on incorporating a pre made nesting box into your bird house. Most birds will prefer a bird house that feels like a hole in a tree; so you want your bird house to feel safe and be comfortable and warm, as well as free of dust and dampness – and of course safe from any potential predators. Using natural materials will help your feathered friends feel at home, so try to find some coconut fibers, plenty of twigs and dry grass, as this will encourage breeding. Weather proofing your house is also a good idea, just be sure that your water proof paint is non toxic and safe for birds – you also wont want any loose bits on your house as they can come off during storms or strong winds. When you set about building your bird house you will find that it can be great fun to involve your friends or family, both young and old. Consider signing up for some online forums to talk with other bird enthusiasts and share your ideas – they will be able to offer you valuable tips and advice. You will find making your own bird house very rewarding, especially once you find a pair of birds have chosen it for their nest.